Who is Igor Lazarev? 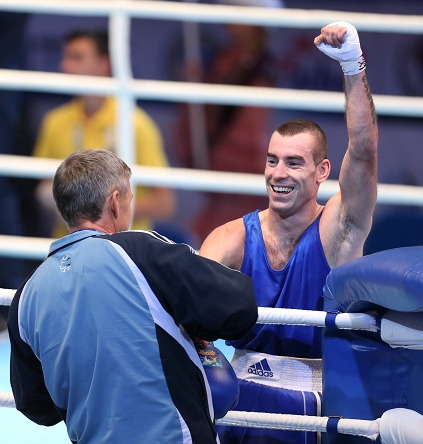 The world found out with a bang today thanks to his shock victory over World Series of Boxing (WSB) Ukraine Otamans veteran and medal favourite Vyacheslav Kyslytsyn in the AIBA World Boxing Championships Almaty 2013. Before that however there were a lot more talking points in today's action. Let's take a look at some of them. In a day with a lot of action, this particular bout may have slipped under the radar a little. Nonetheless, the contest between Lightweights (60kg) Costin-Catalin Gheorghe from Romania and the Venezuelan Luis Diaz was extremely interesting. Both fighters were willing to stand and trade hard shots with each other. However, the South American boxer looked the more composed and he knocked the Romanian down early in the second. Gheorghe was certainly gutsy but seemed unable to adjust his tactics. He continued to take to the centre of the ring and throw bombs at his rival. Yet he was out-manoeuvred by the impressive Venezuelan boxer. Many in the media section were left tipping Diaz to be a contender for the podium following that performance against such a clearly capable boxer. The second Harutyunyan brother (Robert this time) stepped into the ring this evening against Croatian Matteo Komadina at Lightweight. This was more of a brawl than his brother Artem's high paced affair earlier today. Nor did the WSB veteran star have it particularly easy against a well-schooled and confident Croatian opponent. As round two wore on however he began to turn the screw and he scored a good knockdown early in round three. The Croatian kept inviting the punch by boxing with his hands down, and though his evasion skills were good in the beginning, as he fatigued he began to get clipped. He was clearly exhausted by the end of the bout, owing to continual pressure from the German fighter. "I thank god that I got through the fight without any serious knocks, and the same for my brother", said Harutyunyan. "My opponent wasn't bad either. The important thing today really was that my brother and I got through our bouts without any problems. The first fight is always the most difficult with the travel and the jetlag, so I'm happy it's over. I feel I'll perform better in the next bout". Meanwhile Mexico Guerreros star Juan Romero took on Zdenek Chladek from the Czech Republic at Light Welterweight (64kg). Romero's intensity level was significantly higher than Chladek's and he landed some heavy upper cuts early on from in close. The Season III number 7 ranked WSB boxer looked really special today. It is difficult to see many people here with the ability to stop him. Actually there were two.Really big ones! Let's start with the headline. WSB Ukrainian Otamans boxer Vyacheslav Kyslytsyn took on Israeli boxer Igor Lazarev. Again, the superior quality of boxers with WSB pedigree was apparent and he was comfortably and classily winning the opening round when suddenly he was knocked down by a massive right hand from the Israeli. He got up and was nailed again by another huge right hand a few second later, leaving him falling back to the canvas like a boulder bouncing down a mountainside. The Israeli looked as surprised as everyone else by the TKO. "I feel good", he said with a grin. "I just beat a boxer I've watched competing on TV. It's basically the result of the hard work me and my team have been putting in for this tournament. My coach and I watched his videos and we noticed that his left hand was always dropping when he fights. My trainer told me to use the right hand if it happens. I saw him do it during the round so I tried my right hand. When he got up he did it again. So I did too." Palestine had their first ever competitor in the World Boxing Championships today when Mohammedalaa Menawi took on none other than Yasnier Lopez from Cuba. That was probably not the easiest of draws for the Palestinian. The Cuban looked fantastic in the ring and Menawi was taking a standing eight count within a few moments. His coach, perhaps wisely through in the towel with 45 seconds remaining in the first round, which the athlete was bitterly disappointed about. The Cuban graciously held the rope for his opponent to leave the ring. Though clearly unhappy, the Palestinian still earned the genuine applause of the whole arena; as in boxing loving Kazakhstan, the fans all understood what a monumental step he had made for his country just by being ready to step into the ring today. Coming up tomorrow we have the first Light Flyweights (49kg) the Welterweights (69kg) and the Light Heavyweights (81kg). If the tomorrow is anything like as interesting as today was, you won't want to miss the action!